I got home from a spin class the other day and was starving. I wanted something healthy and delicious but something that would also really fill me up after an intense work out. I turned on one of my favourite videos with Yolanda Hadid where she talks about what she eats in a day and she talked through her favourite recipe for oatmeal. Long story short she inspired me to make some Oatmeal and it turned out so good! I paired it with a glass of lemon water and it was delicious. 1 handful of strawberries, washed and sliced. Bring 1 cup of water to a boil on the stove in a medium sized pot. Once the water boils, stir in the oats and sweetener. Cook for approximately 5 minutes or until cooked to your liking. Mix in the vanilla and then transfer the oat mixture to a bowl. 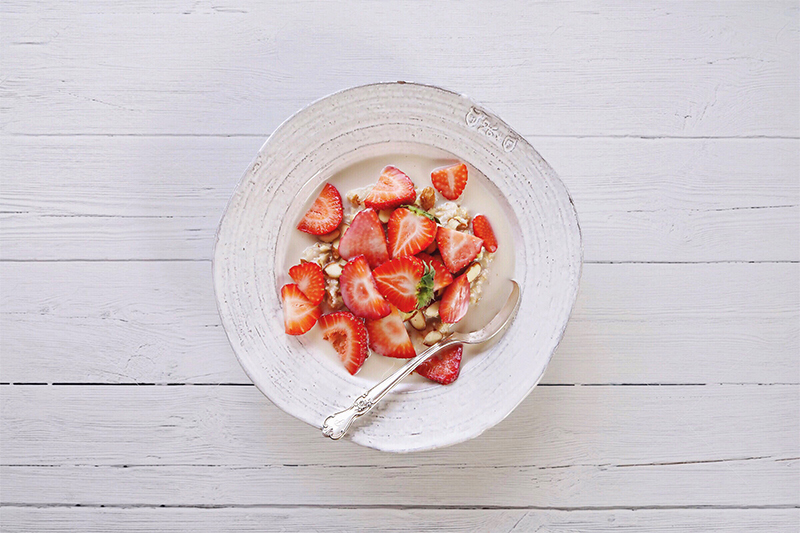 Sprinkle the almonds over the oats, top with the sliced strawberries and pour your desired amount of milk over top. I use unsweetened vanilla almond milk.